Celebrate 50 years of friendship between New Zealand and Samoa with this unique coin! The coloured area of the coin features motifs from tatau (tattoo), which is a symbol of strength in Samoan culture. 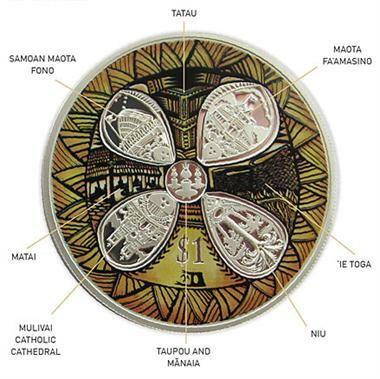 The formal layout of a matai (chief) meeting in a Samoan fale (house) is represented on the left of the coin. ‘Ie toga (a traditional Samoan fine woven mat) represents the binding of families together and is incorporated on the right-hand side of the coin as well as around the rim. The tone of the coloured area references the natural colouration of the endemic hardwood tree ifilele (Intsia Bijuga), which is used to create the form of the 'ava (kava) bowl. The engraved area of the coin is designed in the shape of a pua (frangipani flower). Three of the petals portray important architectural structures including the Maota Fa’amasino (the 110-year-old Courthouse in Apia), the Mulivai Catholic Cathedral and the Samoan Maota Fono (the original Samoan Parliament House). The fourth petal features a coconut tree or niu, which is representative of the importance of agriculture to Samoa’s economy. The centre of the coin features a taupou (young female) and two mānaia (young males) wearing tuiga (headdresses) at an ‘ava ceremony. A taupou is the daughter of a matai and a mānaia is the son of a matai. The coin designer, Michel Tuffery MNZM lives and works in Wellington, New Zealand (Aotearoa), and is a famous multi-disciplinary artist of Samoan, Rarotongan and Tahitian heritage. Tuffery has established himself as a diverse and critical creative practitioner within contemporary New Zealand and Pacific Island art, and his work features in major public and private collections globally. This stunning coin is housed within a crystal glass stand that reflects the architecture of the traditional 'ava bowl and its cultural and ceremonial significance to Samoan culture. Each coin comes with an indiviually numbered certificate, and with a worldwide mintage of only 1,000 this special coin won't last long. So place your order today!